I had an opportunity to check out The Lime in South Tampa with my good friend and partner in crime Lauren. We started off the evening by letting Lime's super fun manager Jordan select our menu. He did not disappoint. One thing I insisted on was the table side guacamole. I can tell you hands down, it was the best guac I have ever had. That say's a lot since I make guacamole at home and always claimed to have the best. 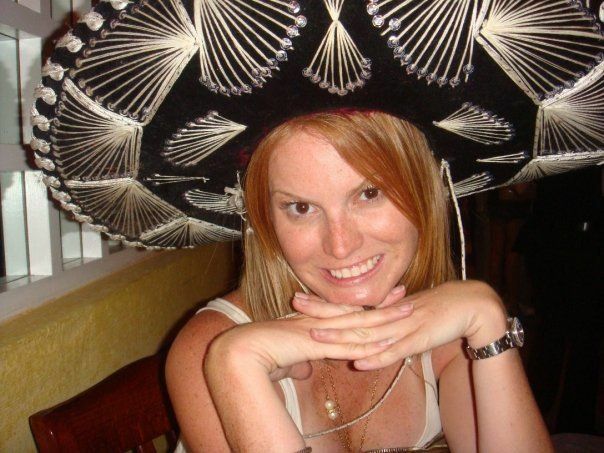 Lime, you took my guac crown from me. #Proof it is made table side: When Guacamole master Ryan asked how we liked it, our response was spicy and salty. We got the Ryan Special and it was perfect. Amazing flavors all around. Lauren ordered the classic mojito which was also excellent! Neither drink lasted very long. Jordan brought out the Super Tuna Bomb: seared lemon pepper crusted tuna with jicama and mango salsa, avocado, plantain chips and srirachi aioli. Talk about all of my friends being on one plate!!! That aioli was to die for. This dish lasted 30 seconds before it was consumed. We also tried Buffalo Chicken Empanadas with Tempura Celery. This was not on the menu but I believe it should be - and fast. It was the perfect combination of spicy and cool flavors. This was my first encounter with tempura celery. Oddly good. Time for our main courses. The one item that Lauren was looking forward to was the Sesame Crusted Tuna Bowl. Rare tuna, pickled onion, diced mango, diced cucumber, avocado and cilantro over brown rice YES PLEASE! It was delicious. The Ciccio's restaurant family are known for their bowls and I see why. We received a second bowl, Pollo Gigante. Avocado glazed chicken with pickled jalapenos and blue cheese, served over jasmine rice. This was another great bowl and would be a good dish for someone who doesn't eat raw fish. The flavors worked really well together. Lauren had those jalapenos all to her self. Since it was Taco Tuesday at Lime, we had to partake in the Street Taco Trio. Taco Tuesday at Lime offers $2 street tacos, with a large variety to choose from. 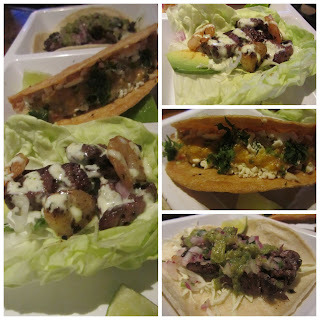 We tried the soft Carne Asada, Ancho Chicken and a special bib taco with steak and shrimp. Very good and at $2, you cannot beat this price. It's time for dessert. I was already starting to see a little cross eyed at this time but we had to push forward. Lauren had Churro's with bananas foster sauce and vanilla ice cream. Loved them. You had me at Flan. It's a weakness of mine and I was pretty giddy when it was presented to me. You can see why. Perfect texture, perfect flavor. If only I wasn't so full! Now that I've made you are hungry, put your creative thinking hat on and help Lime rename their restaurant for a chance at a $1,000 Ciccio's gift card. Click here for more information. See you soon Lime! I'm ending this post with a shameless birthday photo, taken after far too many margarita's (not taken at Lime). Speaking of Birthday's and Lime, if it is your birthday, you receive a free shot. Much cooler than the obnoxious sombrero photo below. Off to run Five miles after last nights meal! It's a fun look right? That tuna bomb was the bomb! We need to make a dinner date here on a Tuesday! Dang...this sounds delicious! I have never really been to the Lime before...but the guacamole has me drooling at the mere thought of it! I'll have to put it on my to-do list to get there! That Guacamole was to die for.